Biofuel is usually produced from substances known as "free fatty acids." However, water can be problematic when introduced into the resulting biofuel through the atmosphere and then result in these fatty acids (the product used to create biofuel in the first place). When methanol is exposed for any length of time to the air, the humidity (water in the air) can react with the methanol and form soap. At ambient temperatures, it can form a gelatinous substance which is difficult to recover from. Since moisture in the air is always a constant, monitoring and testing moisture content for methanol is necessary. During transport, vendors may give opportunity to exposure of air to methanol, which can tend to extract water from the atmosphere. So, it would be necessary to check for water content when moving methanol from the transport vehicle to storage. There is a method of testing moisture content of methanol. The main method is to ensure to test for the specific gravity of the substance (methanol). Make sure to see if the methanol to water content is 95% or lower, if it is, this is too much water content and can be problematic. Specific gravity is the ratio of the substance density to the density of water. If the liquid is lighter than water, it should have less than a 1.0 specific gravity, beyond 1.0, it'll be heavier than water. Density also plays a role in all of this, since temperature variations do affect the density of the liquid. In fact, temperature can effect both specific gravity and density, so it would be important to conduct this test at a specific temperature. 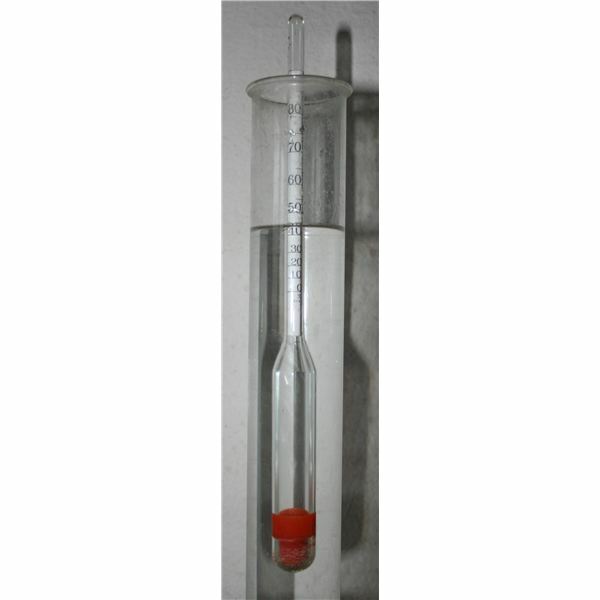 A hydrometer can measure the specific gravity of methanol. When the lower portion or “bulb" is placed in the solution, the specific gravity is based on how much of that bulb sits underneath or above the surface of the methanol. For instance, the specific gravity of pure methanol at 20 degrees C is .7913, but let's say there is water intrusion in the methanol solution reaching the maximum specific gravity of 1.0000 at the same temperature. Then, with a specific gravity of .8957 which is halfway between .7913 and 1.000. This translate that the solution consists of half methanol and half water. There are a couple of other methods used to measure the purity of methanol. The Tralles scale, which also uses the hydrometer device, is typically used in ethanol measurements. Both methanol and ethanol have similar densities. The measurement is a direct measurement. For instance, if there is a reading of 100 on the Tralles scale, it simply means that there's 100% methanol present. A reading of 0 would mean there is a 100% water. Finally, there's the proof scale. This is the measurement normally used to determine the alcohol amount in consumable alcohol. The measurement here is 2 times the Tralles scale. For example, a reading of 200 proof means it's a 100% alcohol/methanol. Methanol is a very dangerous substance, and should be handled with extreme caution. When handling methanol while testing for it's purity, follow some of these safety guidelines. Always wear personal protective equipment (PPE) when handling this substance. This includes safety goggles and gloves. Keep methanol away from any source of ignition, like hotplates, hot air guns, light switches, etc. Run your methanol purity test under a fume hood/cupboard for it has a device that vents the air to the outside of the building. If you're going to be working with small amounts of methanol, which is likely the case, to dispose of it, just dump it down the sink followed by a good amount of water, after all the “solution to pollution is dilution".